Industry is an organization of processing raw materials or semi-finished goods into finished goods finished goods that have added value to benefit. Enterprises assembly or assembling and repair are part of the industry. The results of the industry not only in the form of goods, but also in the form of services. 1 Extractive industry namely industrial raw materials obtained directly from nature. 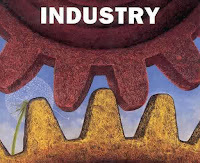 3 Facilitative industry Industrial activities is to sell services to the needs of others. 2 Secondary industry The industry that produces goods or items that require further processing before enjoyed or used.